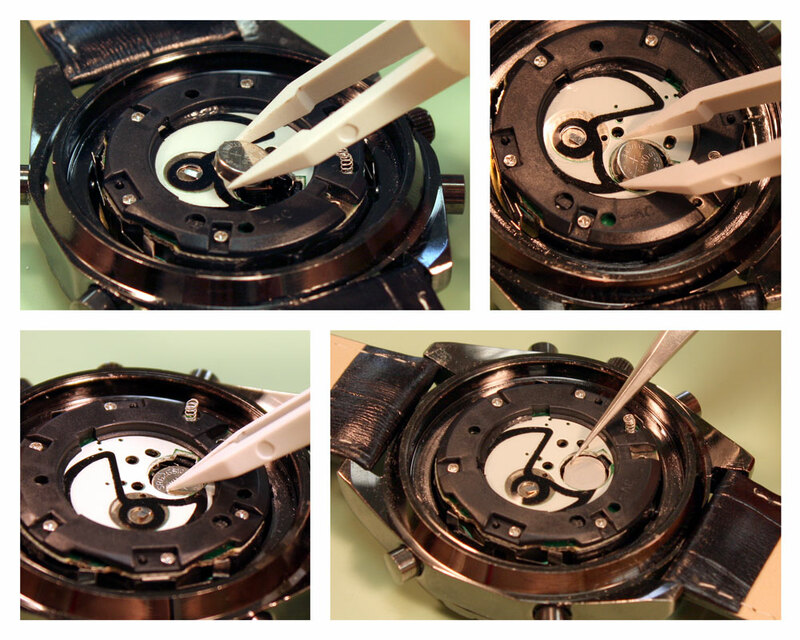 When changing a watch battery, the actual act is fairly simple, but there are many things you need to be aware of beforehand to keep from damaging the watch movement. If you have a watch with both a digital and analog display or one that plays music or has multiple alarms, you can expect to find two batteries in your watch when you open your watch case. Sometimes you don’t realize you have two batteries in your watch until you remove the first battery and see the second one underneath. If your two batteries are stacked, you can use this method efficiently change your batteries. NOTE: You won’t be able to see the number on the battery before you attempt to remove it because the latch strap will cover most or all of the battery. Be sure to remove both of the batteries carefully so you don’t lose them before you can find the replacement number. At this point, you will be able to see the first battery, it will most likely be a lithium battery. It will be held in place with a wide cell strap. Watch movements are very delicate and you should use the utmost caution when working with them to avoid damaging or moving their precision parts. Be particularly cautious of any springs that stick out. With your fingers protected with finger cots, prepare to remove the first battery. 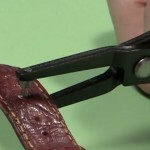 You will have to remove the cell strap that is holding it in place. Unlike most lithium batteries, this is a typical cell strap configuration only larger. Take your Philips head screwdriver and loosen the screw holding the cell strap down by turning it counterclockwise. 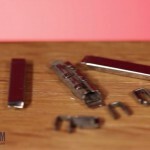 Remove the screw once it has been loosened: pick it up with your non-magnetic tweezers and put it in your parts tray. Then, lift the cell strap up and out to free it from the slot on the other side of the battery compartment from where the screw holds it in place. Put the cell strap in your parts tray as well. Take your plastic tweezers and remove the first battery, you may need to use your non-magnetic tweezers to loosen the battery from its compartment. Make a note of the replacement number on the battery so you can replace it. Now you need to make sure that this battery actually needs to be changed, grab your battery tester and test the first battery. To learn How to Test a Watch Battery – Out of the Case, check out this link. When you know whether or not the first battery needs to be replaced, set it aside. 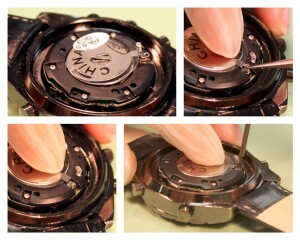 If the battery is good, set it aside to be put back in the watch. If it is dead, set it aside so you can find a replacement for it. Look inside the battery compartment and look for the second battery. You may have to remove a small plastic cover that keeps the second battery separated from the first one. Use your non-magnetic tweezers to lift the cover and place it in your parts tray. Find the replacement number on the second battery. It should be engraved on the battery and facing up toward you. Make a note of the number before removing the battery in case it gets lost. To remove the second battery, you will need your flat head screwdriver. 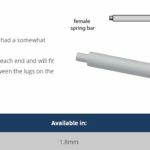 Insert the blade of the screwdriver into the battery compartment and push the blade tip in toward the battery. The battery should slip out of place and end up sitting angled in the cell compartment. 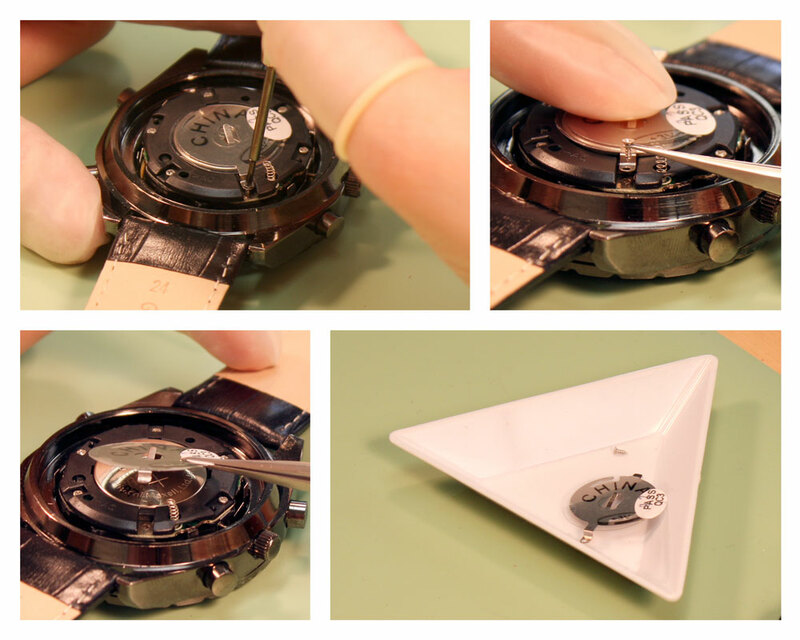 Take your plastic tweezers and use them to remove the battery from the watch. Once the second battery is free, test it to make sure it needs to be replaced as well. 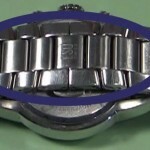 To learn How to Test a Watch Battery – In the Case, check out this link. When you know whether or not the first battery needs to be replaced, set it aside. If the battery is good, set it aside to be put back in the watch. If it is dead, set it aside so you can find a replacement for it. Armed with the knowledge of which batteries actually need to be changed, get the replacement batteries you need to get your watch running again. You may need to use the Watch Battery Replacement Chart to help you find the right size replacement battery for the job. Start by replacing the innermost battery first. Pick the battery up in your plastic tweezers, with the positive side that has been engraved on facing up. Position the battery over its compartment in the larger battery compartment and drop it into place. 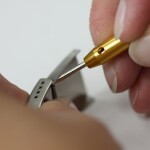 Using the tip of the plastic tweezers, press the battery into position. Grab the small battery cover from your parts tray with your non-magnetic tweezers and drop it into place in the compartment over the inner battery. When the inner battery has been replaced, grab your plastic tweezers again and pick up the top lithium battery. Hold it so the engraved side is facing up. Place it into the battery compartment over the first battery. Don’t be afraid to use your fingers to reposition it so that it lays flat in the battery well. With the larger battery in place, pick up the cell strap and carefully slide the tab on one side of the strap back into its slot in the movement. Hold the cell strap down over the battery to keep it from jumping away and grab the small screw from your parts tray with your non-magnetic tweezers. Set the small screw in its hole so that it will hold the cell strap in place. It may take more than one try to position the screw in the cell strap correctly. Take your Philips head screwdriver and, turning it clockwise, tighten the screw back into place. Once the cell strap is back in place, you can remove your finger from the strap and restart the watch movement. 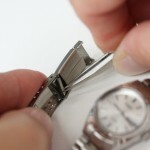 Use your non-magnetic tweezers again to restart the watch movement. Place one tip of your tweezers in the negative port and the other tip in the AC port. Hold it there for a few seconds. When you are sure the watch is working again, close the watch case so you can continue wearing it. Be sure to properly dispose of the old batteries when you are done.